Christmas this year was quite the event or events, I should say! The great part about being a part of a big family is that you get to celebrate multiple Christmases and this year was no exception! On Wednesday we spent the night at Brien's parents house and spent all of Christmas eve day hanging out with our Wood's family! The kiddos baked with Grandma! Kellen was obsessed with the baby Jesus in the nativity and had to show everyone who came over! We froze our heiney's off sledding! So much fun! Every year Brien's mom comes up with the coolest scavenger hunt. Makin' the kiddos work for their presents, I love it! After the kids ravaged their gifts and we stuffed ourselves with dinner, it was time to head back to our side of town. That was a tough drive, we were exhausted! After Kellen went down, we all got cozy in our jammies and watched terrible Christmas movies on netflix. Then Brien and I stayed up and watched my favorite Christmas movie, which is not terrible "Love Actually" and we carried out our Christmas tradition of poorly wrapping presents! Christmas morning we received the greatest gift children can give their parents...sleeping in past 7 AM hurray!! The kids opened their presents, they were very excited about their treasures! Callie got a BEAU-tiful vanity to dress up her already super crowded room, but hey, at least she'll hang on to it for awhile! This was the super surprise present that she asked Santa for last year, 2 days before Christmas. Good things come to those who wait. And those who are persistent! Kellen loved his Thomas tent! Next it was off to grandma and grandpa's house to open more presents and have our Wathen Christmas! My sweet husband remembered that I asked for a fitbit last summer. Score! We had a blast eating and playing and getting caught up with everyone. I just love my sweet family! We had such a blessed and wonderful Christmas! I can't believe it came and went so fast! Now I just gotta get organized and find places to put all of our new treasures!! I'll put that my New Year's to do list! Last year at Christmas our church focused on the "unknown" characters from the bible that were present a Jesus' birth IE-- the little drummer boy, (No idea if there really was a drummer boy, but the thought of a little boy who had nothing to give but his song, it gets at your heart strings!) etc. This last Sunday Brien and I were teaching the 3-5th grade class and one of the points emphasized was that the angel Gabriel appeared to the shepherds and sent them to find Jesus. Our kids totally nailed that shepherds, while important to their communities at the time, were poor and unimportant in the big scheme of things. That really got me thinking...God made himself known to the least important people, because they would have the biggest impact. He didn't go to the kings and prominent people, he came to people that needed him the most. So, when we were driving around yesterday on Christmas errands, I was so choked up when this little song came on the radio! And the year Kellen was born, don't even get me started on God choosing Mary and her having this precious little baby. My point is this...God is for everyone and FOR everyone, if that makes sense. He wants us and he is on our side. I can't help but feel totally overwhelmed at his perfection in everything, Mary, the shepherds, the little drummer boy. It was all a part of his plan, just like he has the perfect plan for us! Saturday morning we decided to venture to the larkridge shoppping center North Pole. This was the same place we went last year. Only this year we made the poor choice of going on a Saturday morning after doing some Christmas shopping. We stood in line and waited and waited. Santa was running a little late I guess?? But the big guy finally showed up and by that time the line had decreased significantly and we were in! Callie cozied right up and got to the business of telling what she wanted. No surprises this year, praise the Lord! And this was as close as Kellen would get! He shouted something about wanting trains and then took his cookies. So much for precious Christmas pictures like last year. Oh well. Maybe next year! After a super long morning/afternoon of shopping and waiting, these kids were ready to go home, but we had a flat tire on the truck, so they had to wait even longer. It was stressful. I am not going to lie. Keeping 2 exhausted kids happy while they wait in a hot truck is not fun! And poor Brien changing that filthy tire out in the wind. Thank goodness for handy husbands! Sunday promised to be better. We had church, naps, Gingerbread houses, Family dinner. It was much better! Kellen refused to stand in front of the tree to take pictures. This boy, I tell you what! Gingerbread housing! They had a blast eating all of the candy. Needless to say there was not much to decorate with, but hey, they had fun and were filled with sugar! Monday, I dropped Kellen off at the babysitter and Callie and I had a girls day finishing up our Christmas shopping, having a delightful lunch. Then home to wrap presents and binge watch "Fixer-Upper" while Callie stewed herself in an hour long "Luxury" bath! So Monday was great! Tuesday, was another story... We had a few last minute Christmas errands to run and then I promised the kiddos that we go to the Jump-o-line place and they could play. I was really thinking, "Let's wear these crazies out, so I can get some crap done!" Kellen hadn't been here since he was way little and had a BLAST jumping on everything! Next, it was home for chicken nuggets and a nap! Well, about an hour into nap time, I heard hysterical screaming from upstairs. NOOOOOOO! I got nothing done! I went up to check on him and put him back to bed but he was furiously scratching his legs and arms. When I pulled up his pant leg he was covered in a bright red, puffy rash. Oy Vay! This kid. I have learned that it's better to be safe then sorry with this boy. Needless to say we spent the afternoon at Urgent care. Callie kept telling everyone who came in the room he had "Boils", she is ridiculous. Allergic reaction. Benedryl and home. So nothing was accomplished except for catchin' up on Sponge Bob in the waiting room. Oh well. We are still 2 for 2 as far as good days. I hope no more "occurrences" or "reactions" crop up in the next week or I will need a break from my break! Cheers and Merry Christmas! Quick and Easy Christmas Treats! So this year we did not do our annual book club cookie exchange. The book club has sorta taken a temporary hiatus, busy-ness, you know. So I had to have some sort of treats for my school Christmas potluck, Sunday dinner Dessert and something to take to Brien's family Christmas. These fit the bill and I may or may not have eaten a bunch of them. Why does food have to be so delicious?? Or Christmas treats! It's for safety sake! Here are three quick and easy recipes for ya!! M&M's (We used the almond kind and they were pretty delicious! 1. Lay out the pretzels on a baking sheet and preheat the oven to 200. 2. Have a handy helper unwrap all of the Hersey Kisses and place on all of the pretzels. Thanks Callie! But they were tasty and when I went back for my container at the end of the potluck, they were gone! You need: Crackers. The recipe called for saltines, I only had Club Crackers. We used about a sleeve and a half for this recipe. 3. Get to work on that sauce! Melt the butter and brown sugar over medium heat. 4. When it starts to bubble a little let it cook for about a minute longer, it should be like a thin caramel. 6. Then pop into the oven for about 5 minutes, until the butter sugar mixture is nice and bubbly! 7. Next, straight outta the oven sprinkle on the chocolate chips and let them melt for a minute and smooth over with a knife. Pop into the freezer for about an hour to let it set up and then break apart! Yummy-oh! This recipe was a little bit more tricky...I should have used wax paper not parchment paper and I recommend a cookie sheet not a 9x11 pan. The weight of the chocolate did not weigh down the parchment paper enough to spread it thinly in the pan, so our bark was super thick and hard to break up! 2. Melt the semisweet chocolate and 1 tsp of vegetable oil in a microwave safe bowl. I cooked for 1 minute and stirred then cooked for about 40 seconds longer, until the chocolate was nice and smooth. 3. Pour into the baking sheet and spread thinly. 4. Put pan in freezer and let the first layer harden. 5. Unwrap and crush up the candy canes. We just did the old candy in a zip lock and take a meat mallet to it! 6. Next, melt the white chocolate, peppermint extract and 1 tsp of oil in the microwave. White chocolate is a little tricky! You have to melt it just right and I think I let ours go a little long and it was not as smooth as it could have been. So about 1 minute and 30 seconds on this one. 7. Pour the melty white chocolate over the semisweet chocolate and immediately pour on the crushed candy canes. 8. Back into the freezer for about an hour. 9. Break up into pieces to make the "bark". Like I said ours was way thick, but it still tasted super yummy!! So there you have it, 3 fairly easy Christmas Treats! They were so fun to whip up while Kellen was taking a nap and more fun to eat when the kids weren't looking! It's finally hereeeeeee! Christmas break! I am almost done with shopping. This year was much better than last. I made a list and had a game plan and kinda stuck to it, so I will call that a success! I finished this book Legend on our snow day! Such a great read. One of my students let me borrow it and it is fantastical! Dystopian, future-y book, but I could not stop reading it. It's totally teeny bop geared, but this grown up lady teacher loved it! Brien and I have been in a show hole for about 2 weeks now. We finished the show Prison Break awhile back and had been alternating between Fixer Upper and House Hunters. Whilst both are great shows, we needed something with a few seasons! This show fit the bill. We cannot get away from crime conspiracy shows. Give it a try! Gettin' my craft on! Last week Brien had a "play date" to watch the Broncos with some of his work peeps, so while Kellen slept and Callie sang "Jingle Bell" rock over and over and over again to learn the words, I had to keep myself busy some how! I was pretty proud of my free hand deer. Just some scrap wood, painters tape, gold, red and white craft paint and I have a new little Christmas decoration! 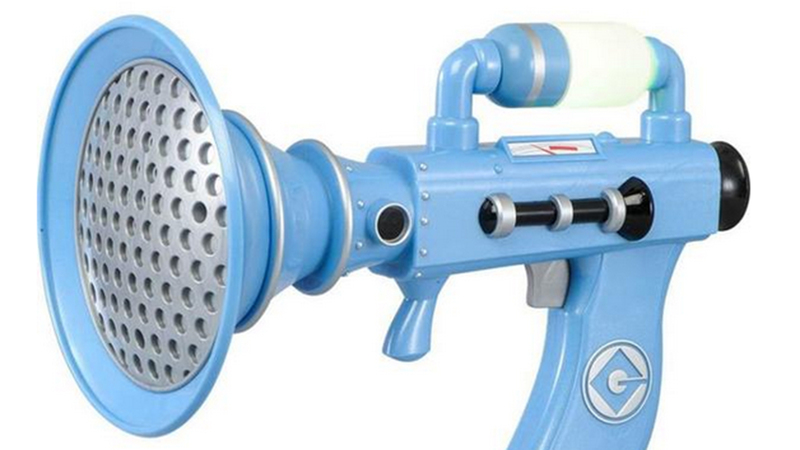 Minions Fart Gun. Need I say more?? Kellen laughed hysterically at this the whole way through Target. I may have went back for it later that day for a Christmas present from my little man. This smile! He has been obsessed with playing with the ornaments on the tree. I have had to rearrange a little and put the plastic ones at the bottom. I can't even get mad when I hear one being ripped from the tree, because this is the face he makes! This week has been short and I am in the winter clothes slump now, so this will be a quick one! A Taste of Christmas Break! Snow day #2! Hurray...I kind of wish it would have come like maybe on Wednesday. I loathe Wednesdays. But beggars can't be choosers. So I had no idea it was supposed to be a blizzard, when we went to be last night at like 10:30 it was totally dry, just a little chilly. So when I woke up to a winter wonderland, I was thinking what a bummer it was going to be to drive in the snow. I got totally ready for work and was about to wake up Callie when my phone chirped with a text message from one of the teachers on my team. I noticed I had two missed calls--One from my school and one from Callie's. If only I had checked my phone a little sooner! Oh well. And that was literally all I did! No chores, no school work, just time with my babies! I hate that I feel guilty. I have presents to wrap, laundry to fold, grades to input, but I did NONE of it. My house is wreck and I am so behind for school and what did we do?? and lay around in our pajamas. Just 2 more school days, We got this.